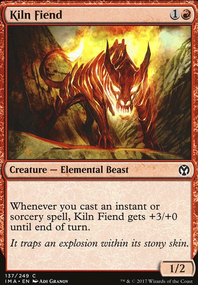 I'd definitely recommend having Fling in the deck, as with Disciple of the Vault + Reckless Fireweaver you will bring the opponent within range quickly. Crash Through will give you a replacement card as well as gives your Atog a way to crunch in for the finishing blow, Rile being another option. 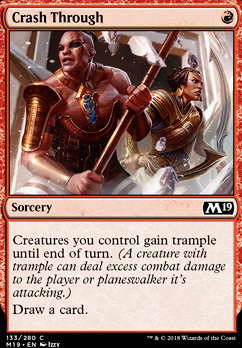 It already looks better with 24 instant/sorcery, and I'd say Crash Through or Renegade Tactics should be useful in lots of situations but not necessary. Forget about Wizard's Retort , too expensive in blue mana for you to be able to cast it at any time. Thanks for the feedback, I was thinking of using Crash Through with Monastery Swiftspear but I guess it won't work as good as I imagine. I will try Magma Jet instead for the scry 2 effect. 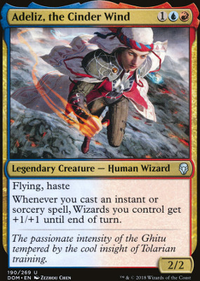 Typically, I'd expect a Mardu tokens/prowess build to feature two cards Young Pyromancer and Bedlam Reveler then around 30 spells as support. 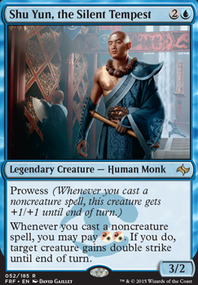 Monastery Mentor could certainly substitute for Young Pyromancer, but it is a turn slower, you also only have 24 non-creature spells, 19 of them instants or sorcerries, none of which are draw spells. The fact that your missing Faithless Looting, Cathartic Reunion, Tormenting Voice or even Magmatic Insight or, stretching to the new kid Risk Factor will hurt you. Instead you have an abundance of removal, but you won't be able to dig very deep into your deck to find the right answer. I like that you are doing something a little diffferent, but when you don't even have a cantrip like Crash Through, I'm not sure this build is right. 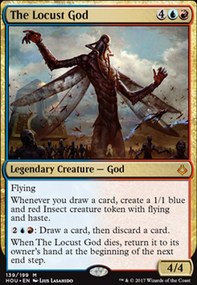 In short, add some form of card draw, Abbot of Keral Keep isn't a good substitute as a creature I'd prefer Soul-Scar Mage, which might help you shrink bigger threats or Insolent Neonate... Good luck with your brew, hope you find this comment helpful. Since the drake is what swings for damage remove maximize altitude, add Crash Through, gets damage through and gives card draw. hkhssweiss on Shamans Altar budget deck series, Zada. Like that your doing a budget series, here are some cards that might be able to help that are less than $1!